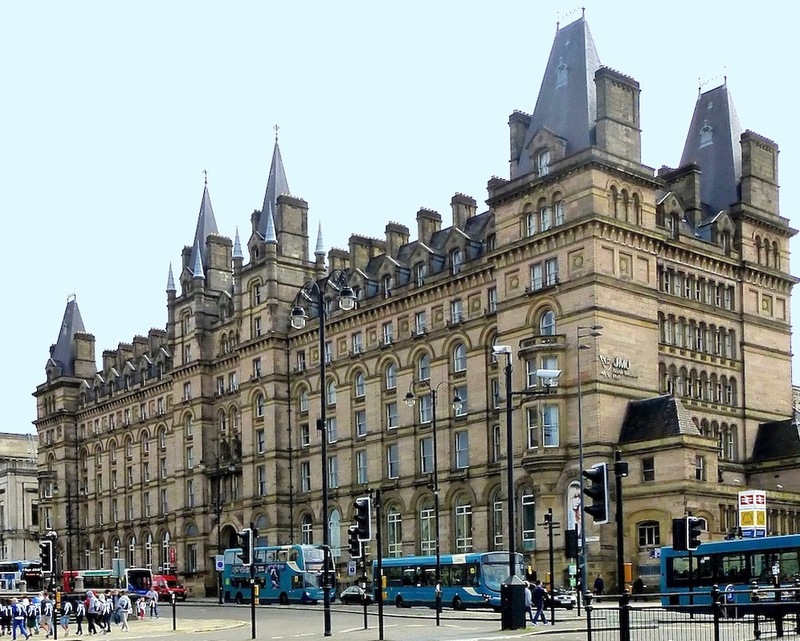 North Western Hotel (now student accommodation), Lime Street Station, Liverpool, seen from the east or station side. Alfred Waterhouse. 1871. Photograph, caption, and commentary by Jacqueline Banerjee, 2009. You may use this image without prior permission for any scholarly or educational purpose as long as you (1) credit the photographer and (2) link your document to this URL. Above the entrance, at third-floor level, are two rather lonely figures on plinths by Farmer and Brindley, which Bob Speel suggests may represent Europe (on the left, with a castellated crown, olive leaves, and a classical bust at her feet) and America (on the right, with a leafy crown, a quiver of arrows, a paddle, and a crocodile at her feet). This is a very small concession to sculptural decoration, even compared to that on the façade of Manchester Town Hall, and illustrates a point that Benedict Read makes about Waterhouse's development — that as time goes by he increasingly "articulates for his detailing the more strictly architectural components (fenestration, arcading, colonnettes, mullions etc.) so as to preclude the use of sculpture as a significant element in the decoration of facades." 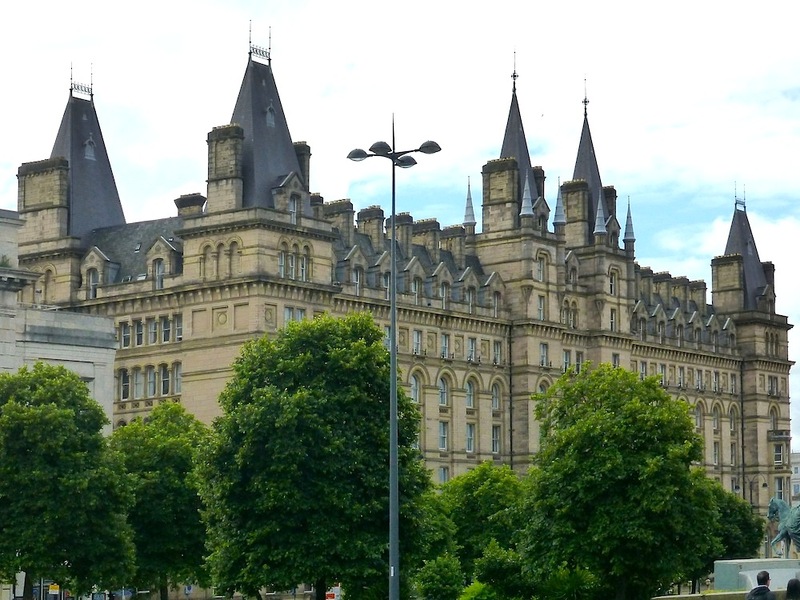 Read continues, though more appropriately for Manchester Town Hall than this Liverpool hotel: "This is paralleled by his concern at the same time for picturesque and elaborate outlines in elevations" (244). The hotel seen from the west side. Waterhouse's massive Gothic structure is right opposite Liverpool's grand neo-classical St George's Hall, making a vivid contrast with it. The station itself is a grand structure, recently restored and of special interest too because the more than 150-feet wide roof designed by Richard Turner, collaborating with Joseph Locke and Richard Fairbairn, was constructed without columns in a single span (Sharples 188). Lewis, David. Walks through History: Liverpool. Derby: Breedon, 2004. Speel, Bob. St George's Hall and St John's Gardens, Liverpool." Viewed 18 May 2009.